If you have property with a garden then you will understand that keeping it under control is no small task and is actually a task that is ongoing throughout the year. We offer a helping hand with garden maintenance in Poulton-Le-Fylde. As the seasons change so also does the gardening approach, understanding this is one thing, tackling it is another. We love any gardening challenge so whether you have a small garden or a commercial business with land that needs garden maintenance in Poulton-Le-Flyde we are happy to help. Our garden services Poulton-Le-Fylde consist of things from the very basic aspects of gardening to the more specific and technical aspects. Having a good knowledge of the gardening industry along with respect and excellent customer care is our aim in providing reliable garden services Poulton-Le-Flyde area. We can help any business or home owner with garden requirements such as landscape ideas, lawn treatments, borders and much more. What do you see when you look out of your window? How would you describe the state of the garden lawn? Can you use the word beautiful? What about healthy? Vibrant? Or are you thinking words more like: patchy, brown and lifeless. 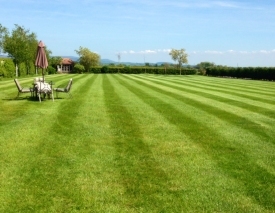 Our lawn treatments in Poulton-Le-Flyde can really help refresh, breathe new life into your garden and lawn and ultimately your view from the window. The lawn treatments in Poulton-Le-Fylde we offer are not just for customers needing to start from scratch but also for those who just want help to maintain their beautiful healthy lawn. Does your garden lack a little luster? Does it feel like it needs a new look? Decking, flagging and patio paving can really transform your garden, how it looks and how it feels. Decking, flagging and patio paving can be used to create a new living experience. Seating, BBQ, sunbathing and dining areas can be simply and beautifully designed with any of our decking, flagging and patio paving options. Not only can jet washing driveways make them look aesthetically beautiful again but really it is a necessary safety measure. One should not ignore the dangers of slippery and dirty driveways and the benefits of jet washing driveways. We offer a service that is thorough and effective. It is important to us that when we are jet washing driveways it is always done so with care as not to damage anything in the process.